Common Names: shellcracker, shellcrappie, government bream. Preferred Habitat: Redear prefer clear ponds, lakes, and slow moving streams, but can be found anywhere where submerged vegetation is abundant. Range: statewide, in warm water habitat. Common size: 6-10 inches, 4 ounces to 1.5 lbs. Food Habits: Redear sunfish feed primarily on bottom dwelling invertebrates such as snails, small clams, and insect larvae. Spawning: The redear sunfish spawn when water temperatures exceed 70° F. The redear is not as prolific as the bluegill, spawning once during the late spring and sometimes again in early fall. Spawning sites are selected in shallow water where the male will construct a nest-like depression on top of sand, gravel, or mud. These nesting sites may be solitary or in groups of several dozen up to one hundred. The female will deposit up to 45,000 eggs, which are guarded and aerated by the male during the incubation period. Miscellaneous: The redear sunfish is also known as the shellcracker. This name comes from the fact the fish has heavy teeth in the throat that allow it to crush hard body invertebrates that cant be used by other sunfish species. The redear is stocked in combination with bluegill and largemouth bass into farm ponds. 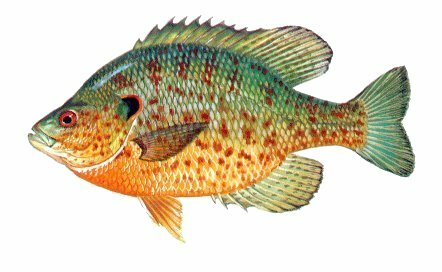 Small redear sunfish are often confused with pumpkinseed. However, pumpkinseed does not acquire the same growth as shellcracker. The red on the gill flap helps distinguish it from the bluegill.